As I typed this article last month, the first bumblebee of the year had just staggered past the window. Spring may not quite have arrived, but winter was over. It was time to get the maps out and oil the chain of that bike in the shed. The Press and Journal serves one of the most astonishing areas on the surface of the Earth: rugged, beautiful and, in places, welcoming. One of my favourite parts of this domain is the northern slopes of the Cairngorms where the hills run down to the Spey around the rivers Tromie, Feshie and Nethy. It’s a place where the majestic granite grandeur of the Cairngorms is softened by trees and the presence of human activity. It’s a place where your heartbeat slows, even as you make your way over the wooded slopes. One of the best ways to explore any landscape is to put a tent on the back of a bike and take off. Sleeping in a place is the only way to truly know it and putting your camping kit on a bike saves your shoulders from having to bear its weight. Why not get the tent from your attic and sling it on the bike in your shed and head off into the woods from the charming village of Nethy Bridge to see what you find? Setting off, you quickly drop into a hypnotic rhythm as the tarmac climbs past quaint cottages towards the woods owned by the RSPB. In no more than two kilometres, the tarmac ends and you dodge around the barrier that prevents vehicles entering the woods. This same barrier means that on the other side it’s pretty much only cyclists and walkers you’ll meet. The track is glorious, a carpet of soft pine needles over hard-packed dry ground. The going is easy and the atmosphere more like a cathedral than a wood. The trunks of the mature Scots pines rise straight from a thick carpet not just of heather but of blaeberry and juniper, cowberry and twinflower. From here the natural thing to do is follow the trails towards the Ryvoan Pass, about 12 km from the start and 200m above it. The woods thin out and the trees, more exposed to the elements, become more sculptural, twisted and branched. From here, it’s a quick drop down past the astonishing An Lochan Uaine to Loch Morlich and the cafes and amenities of Rothiemurchus. Stick to the gravel logging road beside the tarmac heading to the ski slopes and you can reach the forests on the west side of the loch in perfect safety. Cross the road carefully and head south west towards the Cairngorm Club footbridge and Inschriach. This is easy trail riding, suitable for any hybrid or mountain bike, through some of the most glorious countryside we have: old growth woods of birch and pine, heather and the occasional reed-fringed pond. Places to put the tent down are everywhere and you need no one’s permission to do that as long as you respect the land. If the weather is good and you do decide to press on, an objective comes to mind: Ruigh Aiteachain bothy in Glenfeshie. It’s 47km from Nethy Bridge, 20km from Loch Morlich by the trails but a destination so glorious that it’s worth the effort. You head through Inshriach, past Loch an Eilein – watch out for ospreys – and on towards Feshiebridge. From here you can follow the tarmac on the right bank of the Feshie or the trail on the left bank to the pony bridge. The Feshie is a lively river when in spate so you do need to watch out for tracks that have washed away, but there are no insurmountable obstacles at the time of writing. The bothy is on the right bank, reached after a bit of hike-a-bike where the Allt Garbhlach has washed away the gully sides during the floods of 2015. Care is needed here, but it is passable for a fit person, in two or three goes if necessary. From here, another two or three kilometres sees you at the bothy, whose setting will take your breath away. The glen belongs to the Povlsens – Danish billionaires who have allowed the trees to grow back, as well as renovating the bothy inside and out. You can actually feel nature breathing a sigh of relief as the deer have been culled and other species have taken their rightful place. Plant your tent, put the stove on and get the binoculars out. It’s 50 kilometres back to the car tomorrow, but that’s a whole different day and you’ll be a different person. 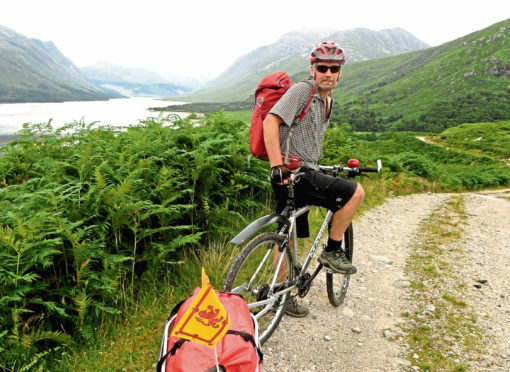 Alan Brown is the author of Overlander: Bikepacking Coast to Coast Across the Heart of the Highlands (Saraband, £9.99) out now.